Black Plastic Body - flexible hinge allows temporary interocular adjustment. Quality plastic optics. You asked for a reasonably priced 2" x 2" 3-D slide viewer with QUALITY ACHROMATIC GLASS LENSES and we've found one we love! It has a light weight plastic body. Simply point the diffuser at a bright light source and you are ready to view. No batteries needed! achromatic glass lenses assure quality viewing for virtually everyone. 60mm focal length offers approximately 4.5x magnification. 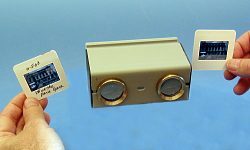 For two separate Left & Right standard 35mm 2"x2" slide mounts. Simply insert the Left mount from the left side of the viewer, and the Right mount from the right side, point the diffuser toward a bright light source, and you are ready for super sharp 3-D viewing! Works with all cardboard and plastic mounts, including GEPE, Wess, Bonum and other popular brands, Glass or Glassless! Try it, you'll love it! This viewer is not for "Realist Format" (1 5/8" x4" or 41mm x 101mm) one-piece stereo slide mounts. To see a viewer for this format click on No. 2034 LuxVue-R 3-D Slide Viewer for details.